The Diamonds Training Center (DTC) continues to provide an excellent benefit to our players and teams. The DTC provides our teams with indoor training options throughout the entire year. 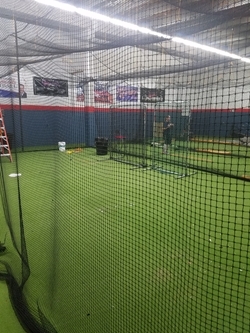 The DTC has 4 tunnels and an open hitting area for tee and soft toss work and includes all the equipment needed for indoor training sessions. Your continued contributions to the General Fund allow up to continue to improve and maintain the facility and equipment. This summer we will be installing turf in the facility along with fencing for safety and a retractable net between cages one and two which will allow for easier transformation for fielding work.